A plan Illinois Democrats are proposing as an alternative to the steep cuts sought by Republican Gov. Bruce Rauner would keep budget levels flat for local governments and Medicaid and only modestly reduce higher education assistance, committee leaders said Tuesday. One day after Democratic leaders announced the $36.3 billion proposal for the fiscal year that begins in July, some of the details became clearer. In several areas, the budget plan contrasts vividly with the plan Rauner unveiled in February, setting up a major test for the newly divided government as the state prepares to grapple with its significant financial problems. "We want a budget that invests in local public safety, in access to affordable education, in people's children and seniors and their health," Democratic state Sen. Dan Kotowski of Park Ridge said. "We're not willing to disinvest in those things." Republicans, meanwhile, met with the governor about returning home to their districts next week to emphasize the need for pro-business reforms before the state can spend more money. "The governor's message is to be vocal, to tell the folks back home what's happening and why we're pressing this reform agenda," said Republican state Sen. Michael Connelly, of Lisle. "The message was to stay strong, that people back home elected him not to nibble around the edges of the budget but to shake up Springfield." 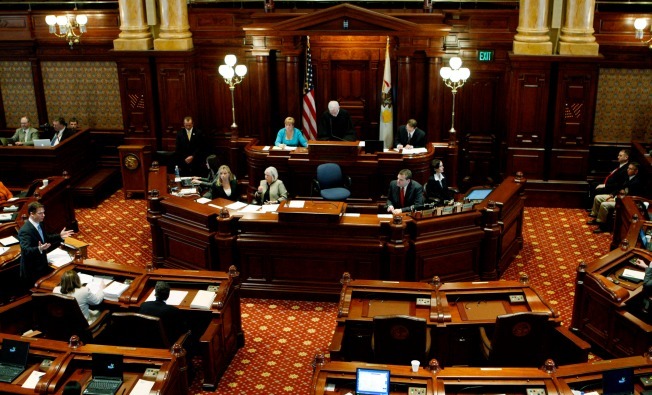 The conflicting messages come as Illinois' first divided government in 12 years negotiates a budget in the final days of the session, which is scheduled to adjourn on Sunday. The way it's going, both sides are predicting an extended, summertime standoff, creating headaches for state payrolls and schools re-opening for the year in August. The governor, a wealthy private equity investor, has declined to negotiate on the budget until the Legislature passes pro-business reforms he says are central to growing the state's economy, including workers' compensation reform, lawsuit reform and freezes to property taxes. But Democratic leaders have reminded him he's under the dome, not in the board room, and announced they would work to pass their own plan on Monday, citing a time crunch and lack of cooperation from the governor. On Tuesday evening, the House passed several of the nearly 20 budget bills that have been filed so far, sending spending plans for human services, public safety, among others, on to the Senate for consideration. The flat spending on Medicaid and local government follow Rauner's proposals to cut state funding for the programs by $1.5 billion and roughly $600 million, respectively. The governor had also proposed cutting public universities' individual budgets by roughly 31 percent apiece. Democrats' plan, instead, would place 6.5 percent cuts on public universities next year, a reduction House Higher Education Appropriations Chair Ken Dunkin called "far more modest." The budget also calls for flat spending on public safety and an increase to spending on elementary and secondary education, though the details on school funding had not yet been filed, as of Tuesday afternoon. To offset spending in those areas, Democrats say they trimmed throughout the budget. An analysis of a majority of the nearly 20 bills that have been filed in both the House and Senate so far found that state subsidies to child care would see a $14.7 million reduction next year, a roughly 3 percent decrease. The state Department of Employment Security, which provides unemployment benefits to former state workers, would see a $9.2 million decrease, also an estimated three percent cut. In an overt display of partisanship, Democratic budgeters also moved to modestly cut the budgets of Republican statewide officeholders, while keeping the budgets of the Democratic officeholders whole. GOP Sen. Matt Murphy called the move "curious" and "a little petty." Democrats acknowledge that the budget — which they say spends more than $3 billion beyond what the state will take in next year — is out of balance. They say they're willing to work with the governor on ways to find additional revenue. Still, with their supermajorities, Democrats could send Rauner a budget without any Republican votes, forcing him veto the entire budget, use his authority to cut specific spending items or sign the measure into law. While lawmakers last year passed a budget on time, it was imbalanced, forcing lawmakers to spend months this spring negotiating a way to plug an estimated $1.6 billion gap. "We've all seen this Greek tragedy unfold," House Republican Leader Jim Durkin said. "... If we pass this budget, this is insanity."